Today, as Chiron turns direct — after 5 months in retrograde motion — you may be thinking about all that you’ve gained through the trials and tribulations in your own life, and how you can pull from those experiences to help others. You may be coming out of a period of soul searching and personal reflection, which when filtered through the Chironian impulse to consider the welfare of others, can act as a powerful conduit to heal those who need healing and acceptance — now more than ever. Chiron is called the “wounded healer” — a reference to the ability to bring comfort and guidance to those who need it, even if you’re still struggling to heal your own wounds. 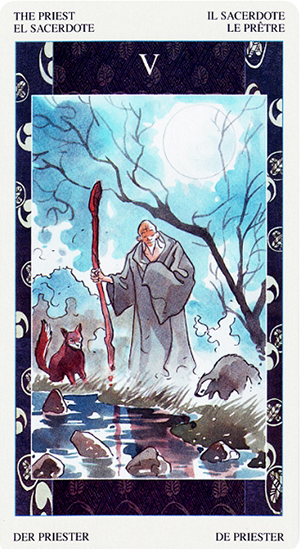 And as you can see in this version of the card, the Priest must rely on his own walking stick to reach the stream he’s guiding the thirsty woodland creatures to. Today is a day to indulge yourself and allow yourself to enjoy all of the fruits of your labors. The Queen of Pentacles is all about establishing security — financial and otherwise. But she also knows how to appreciate the finer things in life and to relish what she’s worked for and savor every moment. She’s not afraid to work for what she wants. But she wants to be able to appreciate it too. She wants to surround herself with opulence and splendor, knowing that she’s earned and deserves it. 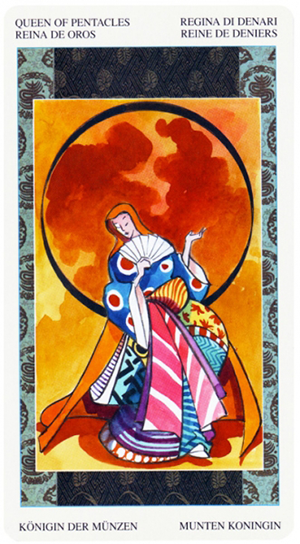 This Queen of Pentacles — from the beautiful Samurai Tarot — is clothed in the finest silks and lavish attire. She strikes an elegant and radiant pose. She is colorful, dramatic and mysterious. But she’s not someone to be trifled with: she’s also practical, efficient and wise. As with all the Court Cards in the tarot, this may be you and it may represent someone in your life. It can also indicate a state of mind that is necessary for you to adopt. Whatever (or whomever) she represents, know that it’s time to get serious about manifesting the life that you want, and enjoying yourself in the process. Today you want to be thinking about your long-term goals and what you might need to do to bring them to fruition. It may require you to make some short-term sacrifices. But what you gain in return — through hard work, discipline and patience — will make it all worthwhile in the end. You may be find yourself dealing with a relentless individual today; someone who’s forceful, angry, aggressive or even ruthless. This Knight of Swords means business. He’s not taking any prisoners or suffering any fools. He may be someone you live with, work with, or know casually. Either way this is not someone you’re going to be able to reason with. 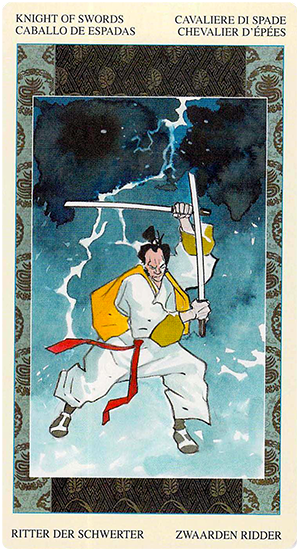 The upside of this version of the card — from the Samurai Tarot — is that you won’t have any trouble knowing exactly where you stand with him. But the downside is that he’s spoiling for a fight and not about to let anyone get a word in edgewise. The Knight of Swords can be a messenger, or a bearer of “news.” In this case it’s probably not going to be good news — notice how dark and ominous the clouds are and how forcefully the warrior slices through the air with his swords. The reds and golds on the warrior’s tunic represent passion and drive. The Swords refer to communications and ideas. And the lightning bolts emanating from the storm clouds represent energy and electricity. 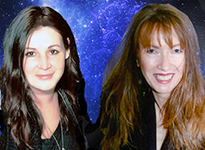 Together they make for a fiery and dynamic energy that can be combative. You may be the recipient of some not-so-good news today, or you may be on the receiving end of someone else’s tirade. You could also find yourself in the position of having to act as messenger yourself, in which case let’s hope you’re a bit less threatening and a lot more genial. In whatever form the Knight of Swords appears to you today, know that you have a choice in now you react. Keep in mind that the message may not be nearly as bad as the messenger. You can try to disarm him with kindness and cooperation, or you can try to deflect some of that energy by meeting him head on. Venus and Uranus are sextile today, making way for unexpected opportunities to increase your luck. Venus rules both love and money, so what better way to attract both into your life than to embrace the ideals inherent in the Nine of Cups? The Nine of Cups is called the “Wish card.” It speaks of manifesting your heart’s desires through aligning yourself with the principles of appreciation and gratitude. This version of the card is rich in symbolism. 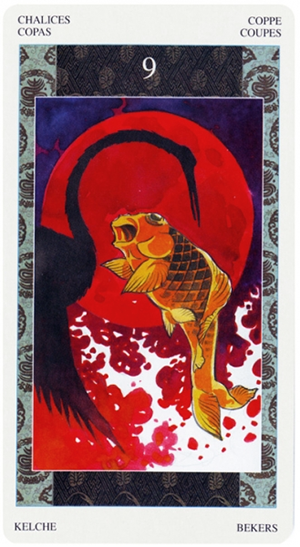 A giant gold koi fish leaps into the air against a blood red Moon. The silhouette of a great white heron on the other side of the card frames the fish in a yin yang formation. These symbols represent the dynamic principles of give and take that are so much a part of the Nine of Cups message. We know that Venus — when it comes to both love and money — must move and flow in order to grow. As an animal totem, the koi fish represents wealth and material abundance. The heron represents confidence and fearlessness. 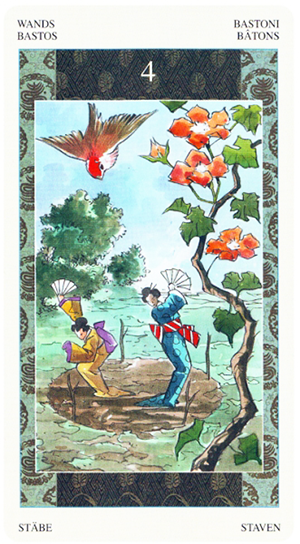 They move together in harmony in this card, illustrating the need to balance these energies in your life. 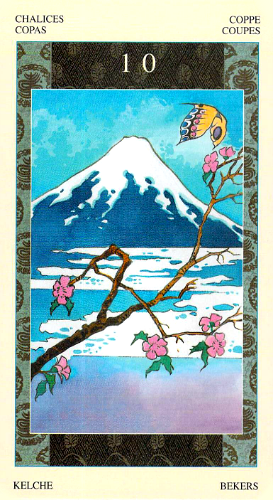 Even the colors of this card speak of fortune and opportunity. Red symbolizes action, movement and energy; gold represents prosperity and fortune, and the indigo hues in the background are tied to the crown chakra and third eye. 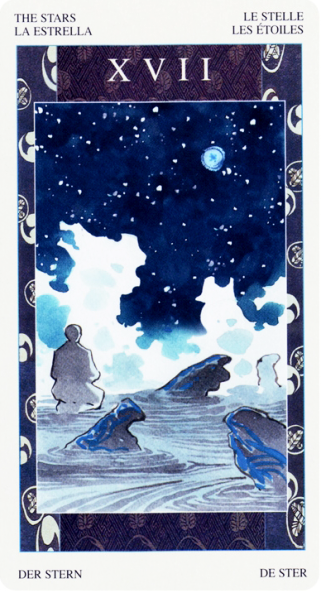 Along with being the “Wish” card, the Nine of Cups is also a card of Miracles. As there’s so much more focus on what one has than what one lacks, it’s easier to notice small miracles and in even the smallest things. With that in mind, Count your blessings and expect good things today! Make some time today to experience some happiness in your life. Be thankful for everything you have in your life and don’t’ go looking for problems. This shouldn’t be too difficult with the Moon coming into contact with Jupiter today which should see your emotions overflowing with joy… enough to melt the snow on that mountain in the distance? You bet! If there has been something you have been troubled over and not sure what you should do about it then perhaps the answer is to do nothing at all. Instead you may wish to be like the butterfly in this card and rise about all that is going on around you seeking out new horizons. This is not a card about adventures it is more to do with feeling content within yourself and with what you have. There is no lack in the 10 cups… it is a card of abundance. Take a leaf out of the image of the flowers blooming on the branches. Nothing can hold back that growth not even with frosty conditions around. Today is like that for you… nothing and no one can hold you back. The reflection of what is in your heart will shine through to yourself and others around you… spread your wings and soar.